Cobblestone Creek features a brand-new golf course designed by Bobby Weed, one of America’s renowned golf course architects. Bobby, a long-time collaborator with famed architect Pete Dye, has created a magnificent new course filled with intricate features, clusters of smaller bunkers, and rolling bent grass greens and surrounds. It’s a modern-day golf course within a traditional and mature setting. Bobby described our new golf course as strategically demanding, with every hole offering risk-reward choices. It will be challenging for the low handicap golfer, but also highly enjoyable for golfers of all skill levels. Bobby said, “This is the best walking course I have ever seen.” It’s perfect for the growing number of golfers who more and more prefer to walk rather than ride. Be part of the excitement at the new Cobblestone Creek Please visit our Membership page for information on membership opportunities. From the meticulously kept landscaping and scenic views to the thoughtful design of every hole, our brand-new course is sure to become the course to play in our area. Our members will enjoy a well-designed blend of a modern golf course in a superb setting at the new Cobblestone Creek. Acclaimed golf course designer Bobby Weed specializes in design, renovation and land repurposing. His “handcrafted” golf courses feature a balance of visual appeal, sustainability and playability, all informed by an environmentally-sensitive aesthetic and an exceptional hands-on, holistic approach. As the PGA Tour’s in-house designer from 1987-1996, Weed was responsible for the design of many of today’s best-known TPC venues, which continue to host prominent Tour events. Weed has collaborated with many of golf’s most familiar names, including Sam Snead, Gene Sarazen, Arnold Palmer, Jack Nicklaus, Raymond Floyd, Jerry Pate and Chi Chi Rodriguez. Weed is currently working with Michael Jordan to design the basketball legend’s first golf course. Cobblestone Creek features two “State of the Art” practice areas. Our driving range covers over seven acres of rolling terrain, including two bent grass teeing areas totaling 20,000 square feet, eight targets and the ability to hit from two directions. Private teaching tees are also available. Our short game area covers one-half acre of meticulously manicured turf allowing players to practice their entire short game arsenal. It features a large bent grass putting green, two chipping greens and a spacious green designed solely for pitching and bunker play. Pro Shop Operated by PGA Head Professional Michael LaBrutto and PGA Professional Chrissy Caramma, our full-service pro shop features the latest in golf equipment, fashionable apparel, accessories and more. 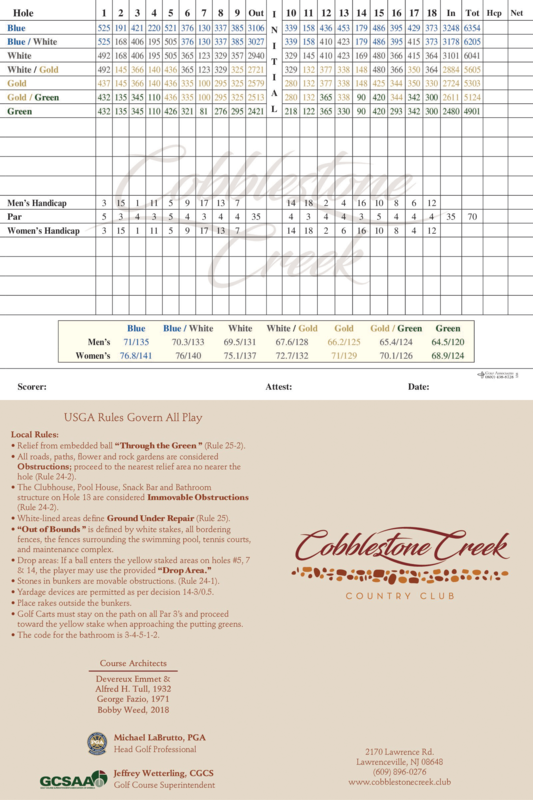 Cobblestone Creek Country Club maintains membership privileges to the USGA, NJSGA, NJPGA, MGA (Metropolitan Golf Association), WMGA, Women’s GAP, and the Women’s Trenton District Golf Association. With a combined 30+ years of experience, PGA Golf Professionals Michael LaBrutto and Chrissy Caramma are dedicated to improving your golf game with private and group lessons, specialized golf schools, on-course playing lessons, short game clinics, video swing analysis and expert club fitting. Cobblestone Creek’s junior program is a blend of instruction and playing opportunities for all ages and skill levels. Offered: PGA Junior Golf League, Sunday family golf days, varsity practice and play programs and a summer junior camp combined with swimming and tennis.